First, please make sure to connect the zip adapter to the jacket instead of trying to connect the green extender panel´s zipper directly to the jacket´s zipper. Seperate the zip adapter and attach it to the jacket extension, connecting the green zippers. 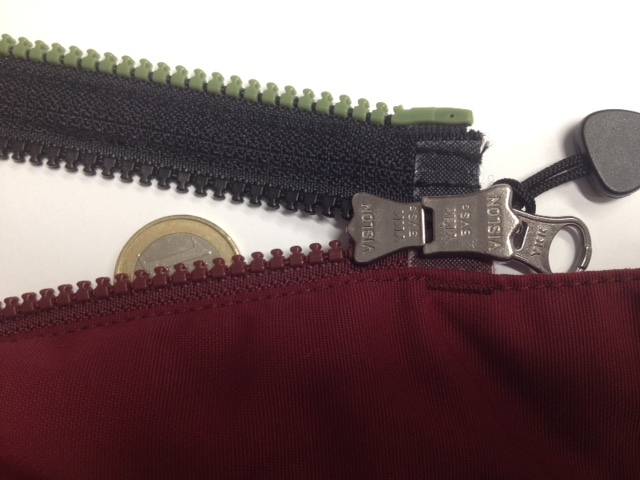 The zip adapter halfves go between the panel and your coat´s zipper. The black zippers then are outside and ready to zip to your jacket. Your Kumja also comes with a manual showing the adapter principle. Please compare the labelling on the zip adapter with the name on your packing slip. Maybe we sent you the wrong item. Let us know and we will react quickly.. Does the adapter only work on one side? Look for FAQ articles tagged with "just one side" to find tips and tricks to make it work. If nothing helps and if it´s about a single adapter (not a test set), please consult our adapter wizard once again to see if you still get the same zip adapter result you got at first. Maybe you confused right and left or missed one slider. If all this still does not solve the problem, give us a call or send us a message. Usually it helps us to get a photo that shows the zip adapter together with the coat´s zipper. One photo of the front and one of the back to see the back side(s) of the coat´s slider(s). We will do our best to find a solution.